thickcrust.com: How do you start this car? When I arrived in Strasbourg, I picked up my rental car. I requested a car with an automatic transmission and GPS. The only automatic they had available was a huge BMW station wagon. I didn't want to drive that big a car for the week, so I requested a smaller car, regardless of the type of transmission as long as it was equipped with GPS. 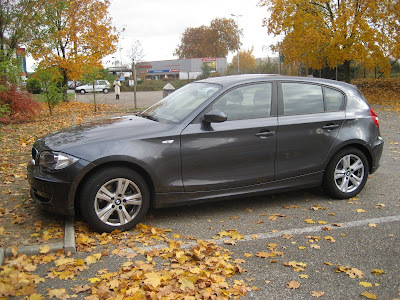 I was given a gray hatchback BMW 120, which was perfect. The hatchback made it relatively easy to get the 60+ lbs box of laptops I was traveling with in and out of the car. The car had a manual 6-speed transmission. This was only the third manual car I've ever driven (and that is counting a friend's Volkswagen that I drove 3 miles once). The car was very easy to drive. Not so easy to start. First off, the car had the same kind of key that my rental from Germany had (just a stick you insert into a hole). I inserted the key and then wondered what to do. Then I noticed a start button. I pushed the start button and nothing happened. I pushed it a second time, then a third time. Then I removed the key and tried again. Eventually I stopped my exercise in futility and sat quietly, contemplating what next to do. I really didn't want to return to the rental counter for a third time. Then it dawned on me: don't you need to press the clutch in order to start a car with a manual transmission? That was my problem. It's moments like that when I appreciate traveling alone.